I have two raspberry canes in a large tub in the garden. I did have three, but one just withered away, despite my best efforts. They are an autumn fruiting variety called Joan J and the remaining two are very reliable. I chose autumn fruiting because they are easier to prune - just cut down all the canes to the ground in February and they fruit on the new canes grown each year. I have watered and fed them and watched the flowers being pollinated by the bees and the fruits forming. However, as I only have two canes, sadly I don't get enough fruit to make jam. So, I have eaten them straight off the canes when they are sun warmed, but as the days are getting cooler, I was wondering what else I could do with the small handfuls. I have made pavlovas in the past, but they are strictly for a treat. I think I may have found the perfect solution. We use the Easi-Yo yogurt system, where you add a sachet of mix to water and then put it in the yogurt maker (filled with just boiled water) overnight. 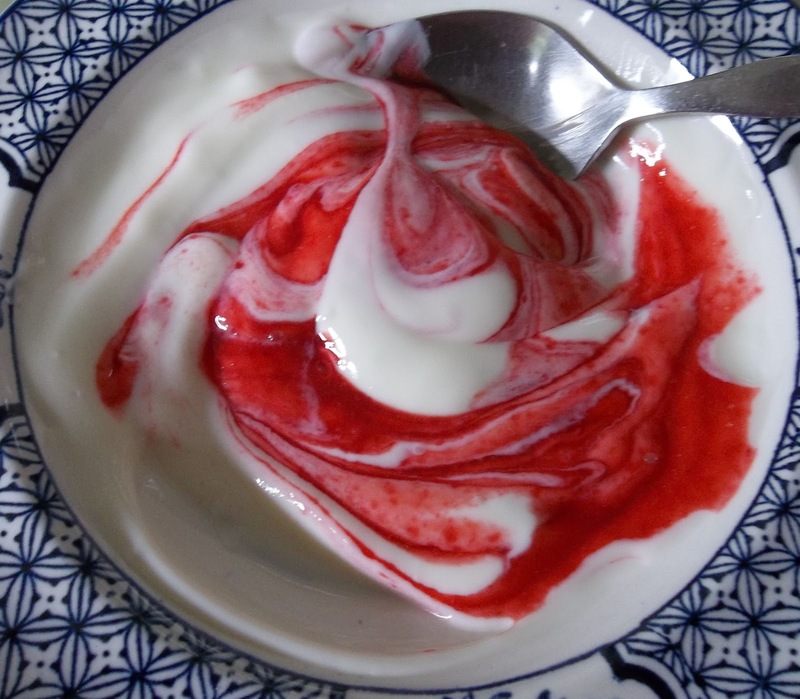 We like the low fat Greek style mix as it is versatile to use in cooking as well as eaten as a yogurt, usually with honey added in. 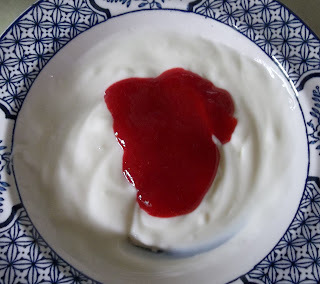 In a flash of inspiration, I decided to make a raspberry sauce for the yogurt. 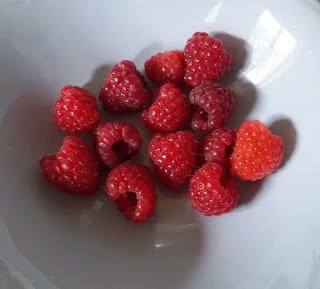 I put the raspberries into a saucepan with some cold water and five (ish) teaspoons of icing sugar (depending how sweet a tooth you have) and then boiled it up, stirring it well. I boiled it for about five minutes or so and let it cool slightly, before putting it through a sieve to remove the seeds. As you can see, it has a beautiful colour and I can vouch for the fact that it tasted delicious! It makes a really nice change from honey and it is a good way of using up the raspberries too. Perfect! Thanks, Jo. Considering it was a bit of an experiment, it worked really well and I am sure that more will be made. Though I doubt I would have any left-overs. Raspberries are right up there in the favourite fruit stakes. And the birds are much faster than I am in spotting ripe ones. Thanks, EC. I grow raspberries and blueberries and (so far) haven't had any problems with the birds beating me to the fruit. Perhaps the huge number of plants I have crammed into a small space camouflages the fruit? I am pleased that the birds do seem to leave them alone - there's not enough to share! Thanks, Dotty's Daughter. It is such a success that I need to make some more now! That looks so delicious!! A very nice reward for you for taking such good care of your plants :-). Lots of love from Mirjam. Thanks, Mirjam. It is delicious and I have just made some more using raspberries and blackberries too, from my mum's garden.